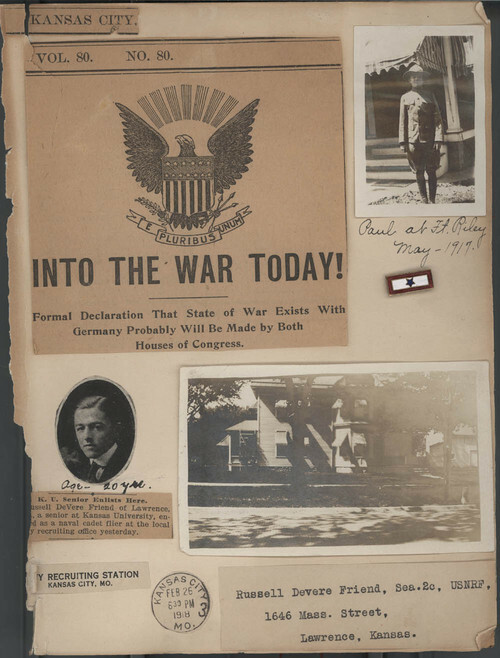 A scrapbook page with a newspaper clipping announcing "Into The War Today! Formal Declaration That State of War Exists With Germany Probably Will Be Made by Both Houses of Congress" and an article and photo of Russell DeVere Friend, Lawrence, Kansas, who enlisted in the military as a naval cadet flier. Also, on the page is a photograph of Paul Friend, who enlisted at Ft. Riley, and the Friend home at 1646 Massachusetts, Lawrence, Kansas.